Containing quality ingredients and no artificial flavors, Monin premium raspberry syrup is a quick and easy way to add new flavors to a variety of recipes! Add a splash of this raspberry syrup to your popular cocktails and mocktails and it's sure to please your guests. The refreshingly tart taste and bright red-purple color of this flavoring syrup will enhance the fruity profile of your mixed or blended drinks without overpowering them or being too sweet. You can even use this syrup for iced teas, lemonades, mochas, and margaritas. The monin premium raspberry syrup is sweet and tangy making it a great addition to our bar. The raspberry flavoring goes perfectly in our spiked teas and lemonades. 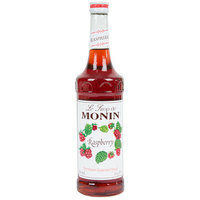 Rasberry Monin syrup has a rich and perfect flavor for your mock-tail cocktail, tea or soda. Rasberry Monin syrup is the right choice for you because it gives a perfect sweetness and true flavor for your mixed drinks. I love the real fruit taste of this raspberry flavoring syrup . It is so good mixed with white chocolate sauce to make a white chocolate raspberry mocha. The raspberry syrup is great. A fresh raspberry lemonade or raspberry tea is a delightful way to cool off on a hot summer's day. The raspberry syrup is sweet and tangy and taste like freshly picked raspberries. A great option of specialty teas or lemonades. Noticed a big difference in taste switching over to Monin brand! The raspberry in particular, while it is sweet, does taste like fruit. It's improved our lemonade and latte recipes that are made to order with this coffee syrup. Would definitely recommend. This is one of the best Monin flavors I've tasted. I love the smell and the flavor is just as good. Everyone who has tried it has loved the taste. Cant lose with this one. I've had many raspberry syrups before and this one is the same or more quality. Honestly I can't tell the difference between the raspberry syrups offered by Monin. They all taste wonderful as a soda or even on a snow cone.Would recommend. We use this syrup in our Raspberry White Mocha and it brings the perfect combination of sweetness and tartness! Our customers LOVE this drink, and I highly recommend all of the Monin syrups. They taste way better than the other brands of syrups! I enjoy tasting and using different flavorings. This is a good raspberry one. It's sweet and fruity but not that sticky sweet candy like taste. This add a pleasant flavor. Monin makes fabulous syrups. They can run a tad bit pricier. Try one ounce of any Monin syrur on ice with soda water and you have yourself a very tasty Italian soda! This syrup is pretty good, but like other Monin fruit syrups, a bit thinner than I had expected. I bought this syrup to use in italian sodas, and I have found that raspberry with french vanilla added is divine. I have also added this syrup to southern-style sweet tea in place of some of the sugar, and it is great. This Monin raspberry is a perfect blend of sweet and a bit of tart. I love adding this to a black iced tea, lemonade, or a mocha. Love these syrups! Gave up soda and now ad a splash of flavor to iced tea! This one is especially delicious! Cheaper than buying from food service! Out of the three top brands that make raspberry flavoring in a pump bottle i have to say Monins was the best. Very good quality flavor. This is a fantastic price for such a quality raspberry fruit syrup! I love using this syrup to flavor homemade ginger ale! I really like the color it adds to drinks too! Raspberry is my favorite fruit, and this is one of my favorite syrup flavors! I love raspberry with French vanilla, I call it "raspberry cream" and it is just delectable! Our raspberry chocolate chip ice cream is great and the fruit syrup is the perfect way to achieve the best raspberry flavor. Mixes in to our ice crema base perfectly with a great tart flavor. The raspberry fruit syrup is a great way to make in house flavored soda in no time. The raspberry puree is a great tasting syrup and compliments all our sodas really nicely. The raspberry flavoring syrup is terrific and a true fruit flavored syrup. Terrific for making raspberry cordials. The syrup has a great color and makes our drinks look awesome. Nice, authentic raspberry flavoring. The flavoring is not too sweet and tastes just like the berries you get off of the bushes. This flavoring pairs nicely with specialty coffees. I started using this Raspberry syrup to make Raspberry White Chocolate Lattes. They came out perfect. A real nice raspberry flavor without being overly sweet. We love using this raspberry flavoring in our mixed drinks, especially with a good stout. It has a smooth flavor that makes it sweet, but not overbearing. Very high quality product/flavoring syrup that every bar should be stocked with at all times! I ordered a few because the price was so reasonable and even with shipping it was still priced lower than any other retail store! Awesome raspberry flavoring fruit syrup that is fresh and great for making fresh raspberry filling for our bagels and pastries. A great product with extraordinary taste. You can make any number of different drinks with this raspberry syrup. It has a great flavor and we are about to stock up on it as soon as we run out of it. I love it so much! A nice style raspberry flavoring perfect for making any style drink or cocktail. A nice price. The raspberry syrup smells wonderful and tastes really good. As always Monin stays true to flavor. Their products always go for taste rather than just being sweet. However I do like DaVinci's Fruit Innovation as well. Love Love Love Monin products! We love this Raspberry syrup. We love pairing it with chocolate. The only issue we have with it is that if you dont mix the raspberry syrup with the espresso before you pour the milk it curdles the milk. So just make sure to stir it well with something before you mix it with milk. So excited about this syrup. It smelled amazing when I pulled the cap off and reminded of fresh muddled raspberries. A great flavoring for sodas. A nice thick raspberry flavoring syrup that is great for adding a dash of raspberry tartness to your coffee. The syrup is perfect and is well packaged. I love this monin premium raspberry flavoring syrup. It adds a nice touch to so many different things and I use it all the time now. A super good premium raspberry fruit syrup that is wonderful for making our raspberry pancake glaze. The flavor is fresh and my kids go crazy over it. The Monin raspberry flavoring syrup is tangy and sweet just like a fresh berry. The raspberry syrup is perfect for flavoring teas and making Italian style sodas. We love this product and use it daily, We are very satisfied with this purchase! We use this amazing product because it taste amazing and our customers love it in their coffee and tea. This syrup is the perfect addition to any coffee or iced tea! Our customers love it, and so do we! The pump makes adding it to beverages quick and easy! It's also makes a good addition to a raspberry cake filling! This syrup can be used for many different things! Monin syrups are great. The flavors taste great, are of high quality and most are GMO free. Our customers love the quality and taste! Definitely a great choice! We use this raspberry syrup in our mochas and white chocolate mochas. It is the most authentic tasting raspberry we've found. Also really good in blended drinks. We ordered six flavors of Monin syrup for a welcome dinner at our wedding, and they were all a hit with kids and adults. The bottles arrived very well packaged. Some of the shipping stickers were a pain to take off - they were covering the flavor of the syrup - but gentle pulling removed them without too much damage to the label. People seemed to use/prefer less syrup than we expected, and less than the 4 pumps per drink that Monin recommends, so we have plenty of extra after an evening with about 60 people. Raspberry and Strawberry were our two most popular flavors, I would definitely recommend them in any lineup.